Does Bernie Sanders believe in God? Looking at the 2016 presidential race, it’s easy to get distracted by Donald Trump’s rantings and ravings, but there’s another surprisingly popular candidate that has continued to make waves with his growing group of dedicated fans. I’m talking about Bernie Sanders, of course — the democratic socialist who is still within striking distance of Hillary Clinton’s poll numbers in some key battleground states. He visited Jimmy Kimmel Live this week to discuss his campaign, and one remark in particular has started to make waves on the internet. Kimmel kicked off the conversation with a tough, but reasonable, question: Why should the American people believe that Bernie Sanders is an electable candidate? He gave a strong answer, pointing specifically to the fact that some polls show Sanders winning by a larger margin over Trump than Clinton would be able to achieve. 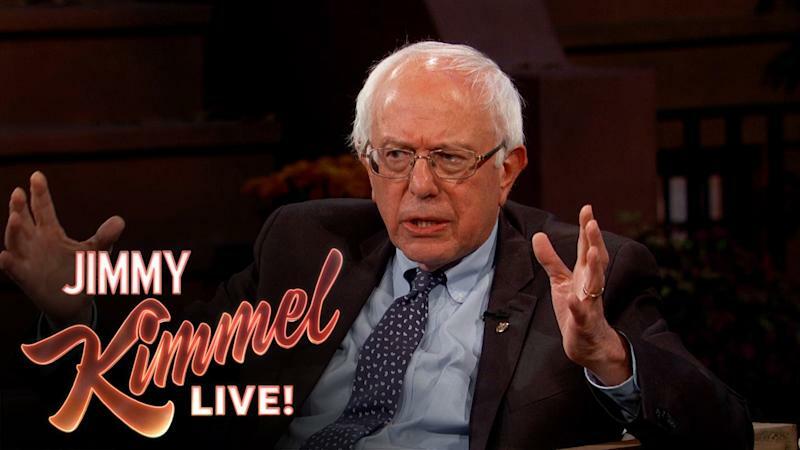 During his answer, he quipped: “When Republicans win — God forbid — when they win, voter turnout is very low.” After he’d finished his thought, Kimmel turned his attention back to the word “God,” which Sanders had used in the context of a joke. If you’re looking for a straight answer from Bernie, you’re not going to get one, but what we get instead is a genuine, heartfelt message from a politician, which is a rare sight.